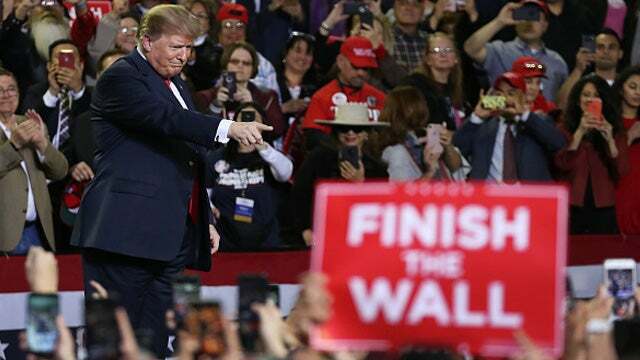 RUSH: Trump at his rally in El Paso last night. Poor Beto O'Rourke looked like a jack-in-the-box. He looked out of place. He looked unprofessional. It looked like speaking on stage did not appear to be Robert's forte. He had a crowd of hundreds. It was kind of funny. 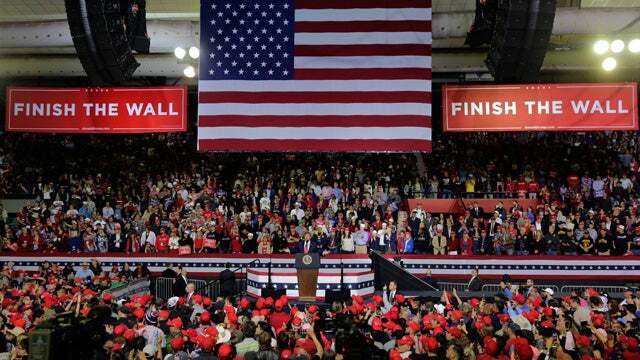 They had this giant, big screen behind O'Rourke, and on that big screen the O'Rourke audience could see the Trump rally and could see Trump being introduced. There were eight or 10,000 people in that arena and thousands and thousands and thousands of more outside the arena. So that partially sets the table. Greetings. Great to have you, Rush Limbaugh here at 800-282-2882. All right. Let's look at the compromise deal regarding the budget and the border wall, border protection, border security that has been announced. Now, a little history here. Because the big news, the Drive-Bys are going nuts here over the fact that congressional negotiators have come up with a deal to fund the Department of Homeland Security in principal. The president is said at this moment to be undecided. He doesn't know yet how he is going to react, according to the Drive-By Media. Now, let's go back to December 19th when this all began. I was complaining about the media talking about the great compromise bill they wanted Trump to sign. And I meant, and I pointed out back then, that if Trump signed it he would get even less than nothing because originally the Department of Homeland Security funding included $1.6 billion for the wall that did not appear in the compromise bill that Trump was to sign. It got stripped out. So that's why I characterized this as Trump getting less than nothing in the new deal. And the media was calling this the great compromise and this was gonna go forward and they were reporting that Trump was getting ready to sign it. And, of course, I pointed out that that's crazy, that’d be crazy to sign this thing. Trump's getting less than nothing. He had $1.6 billion, and it's been removed. Well, at that point I got a text message assuring me, "Don't worry. The media reports that Trump's gonna sign this thing are wrong. He's not gonna sign it," and so forth. So I announced the president had gotten a message to me that he's not gonna sign it. That then became the president was gonna sign it until I weighed in and told him not to. And even now let's go to audio sound bite number 1 with this new deal. Here are the Drive-Bys last night and this morning wondering what's gonna happen now. KRISTEN POWERS: Rush Limbaugh and Ann Coulter freaked out and he sort of caved to that. His initial impulse probably was right. CHRIS MATTHEWS: Rush Limbaugh and the rest of them, they were all pushing for the wall or else you're a weakling. JOY BEHAR: Last time this happened, he was listening to President Limbaugh. JOE SCARBOROUGH: He listened to Rush Limbaugh and he lost like six, seven, eight points in his approval rating. And the question is will he be that stupid politically again to do it? MAX BOOT: I just don't see how he's going to get a better deal. But I think we still have to wait for President Limbaugh to weigh in. RUSH: That was Joe Scarborough here who said that President Trump lost six, seven, eight points in his approval rating. I beg to differ. President Trump's approval rating's at 52. It was at 43 at the time of the shutdown. The president's approval numbers have skyrocketed on the basis of this shutdown. Republicans benefit from these things but you'll never convince Republicans in Washington that that's the case, but they do. Historically they've never been hurt politically, not dramatically, not even a smidgen by these shutdowns. Only in media reporting do Republicans get hurt with shutdowns. How does Trump approval get up to 52% if the shutdown hurt him? Somebody explain this to me, even with the State of the Union in there? How does this happen? He didn't get hurt by shutting down the government. Besides, that government shutdown served to demonstrate, once again, because the media covered it all day every day, and in the process explained to a lot of Americans what was at stake. Americans who didn't know what was at stake because the media doesn't tell them the Republican side of things or President Trump's side of things. So shutting down the government was actually a political benefit for the president, which any time the president can do anything that helps the American people learn things they don't know because of what media does not tell him, it's a win-win. And so the shutdown, I don't know how anybody can argue that it hurt the president when he's sitting there today at 52% approval. Well, let's get to the details of the compromise legislation. This new offer from the Democrats -- they've come off of zero. They're now offering money for a wall, $1.375 billion. And I have to point out that that is still less than the original money agreed to by the appropriations committee. This $1.6 billion that was on the table before December 19th that then got pulled out in the compromise between House and Senate. And the continuing resolution that Trump had in front of him had no money in it, nothing, whereas the Senate side had authorized $1.6 billion that got pulled out in the compromise so that's why I said he's getting less than nothing. Well, $1.375 billion is back in, not the $5.7 billion he said he wants. This will pay for 55 miles of the 64-mile expansion that the president wants. So we go from a bill that had no money in it for the wall -- well, that originally had $1.6 billion in it, but that was taken out in compromise -- to the shutdown, and now a deal where the Democrats have agreed to put $1.375 billion back in. That will help the president, allow the president to build 55 miles of the 64-mile wall expansion that he has sought. Now, bear in mind the president was pushing for $5.7 billion for additional walls because Border Patrol experts said they were desperately needed. The $5.7 billion wasn't just pulled out of the air. It was money the president was recommended by Border Patrol experts, what they needed to do their work. Now, another part of this deal is that the Democrats have graciously agreed to move off their insistence that the number of detention beds for illegal-alien criminals be capped at 16,500. They seriously wanted to limit the number of criminal illegals who could be detained, and once that limit had been reached -- which we have reached it and gone beyond -- they'd just be released "into the wild," so to speak. 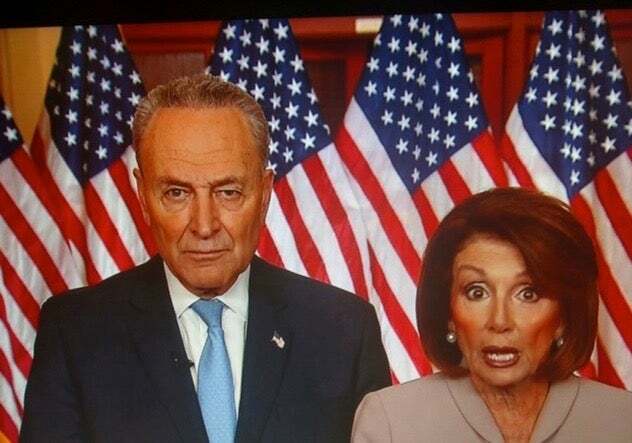 Now, in this compromise deal, our gracious Democrats are allowing funding for 40,520 beds -- in other words, the ability to sleep or detain 40,520 criminal illegal aliens. That is the number of beds funded in the last budget under Obama. Trump wanted it increased to 52,000 because of his efforts to round up more illegal alien criminals. So you've got movement here. You had zero. Well, you had $1.6 billion authorized. Then it was taken out, so you had zero. So you could say less than nothing. Then we got the shutdown. The shutdown goes on. Trump's approval numbers skyrocket from 43 to 52%. State of the Union's in there. I maintain there were benefits of the shutdown that the Drive-Bys and all of these talking heads who say the same things... No matter who's speaking, they say the same words, same thing. They will never agree that Trump benefited from this, but the numbers don't lie. Everything else going on in the country, jobs-wise, economics-wise, all explains this. By the way, I'm gonna tell you something else. Let me hopscotch back here for just a second to this John Dowd story. If, in fact, this is true -- and if, in fact, Mueller does not issue a report. If he doesn't, what is that gonna do to Trump's approval number? It's going to skyrocket! Even if Mueller issues a report and in that report there's no collusion with Russia -- which, remember, 42% of the American people have been misled by the left wing of the Democrat Party and the Drive-By Media into thinking that actual votes were tampered with and the outcome of the elections were affected by Russian collusion and meddling. If Dowd is right -- and Dowd has been Trump's lawyer from the get-go on this. If Dowd is right that there's no report and certainly no evidence collusion (and the Senate Intelligence Committee has said the same thing now), what's that gonna do to Trump's approval numbers? So this has to be factored in as well, I think, if you're talking about the politics of all this. So we start with $1.6 billion gets taken out. We got zero. We got a shutdown. The shutdown goes on a significant amount of time; the American people learn what's at stake. The American people, because of the never-ending reporting by the Drive-By Media, find out what the shutdown's really all about, and they find out that one side wants essentially open borders with no limits on the number of illegal immigrants that could come into the country. That's good for us. People didn't know this. People have a different perspective. The people that listen to the Drive-By Media think that Trump is separating families and mothers and children are in tears all day and we're distorting and destroying families all over the world. They got a chance to see the truth and learn the truth. I think it was a deft maneuver by the president. So now here we are at another compromise, which authorizes $1.375 billion -- less than the $1.6 billion, but still greater than the zero. So let's look at the options. If the president signs this, what can he say? He can say, "Look, I wanted a 64-mile expansion of the wall. I got 55 here, and it's just a continuation." One of the president's themes last night was we're already doing it. We're already building the wall. We're already expanding; we're already modernizing. This will be portrayed as a continuation of something that is already happening. He could portray it as a win, because the Democrats were offering zip, zero, nada -- even though it's less than what Trump said he wanted. Both sides -- the Democrats, knowing them as I do -- would claim victory as well over this. 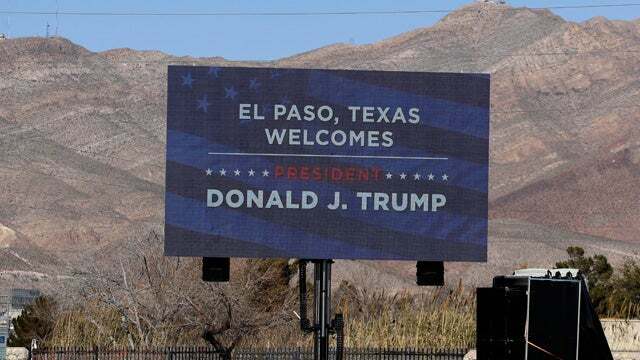 But then the president can continue in his efforts, because the politics of this is, or are, the president's wall and the construction of it basically means border security, means shoring up the border and stopping this endless flow of illegals. Anything that happens that solidifies and cements that effort as being undertaken and underway, the president can portray as a win. He can always hold out the card of a declaration of a national emergency to get the rest of it built and so forth. So I don't know what they're thinking in the White House on this. But I'm sure they're looking at it somewhat similar to this. "If we sign this, how can we portray this as a win to our people?" And they could. I mean, they could. How many of you...? Let me ask you. How many of you who voted for Trump, supported the shutdown, still support the shutdown, still believe that immigration is one of the top-tier issues that's gonna determine the fate of this country and our culture going forward...? How many of you would be angry, frustrated, and at your wits' end if the president did sign this? In other words, if the president signs anything that allocates, appropriates less than the $5.7 billion he was demanding or asking, how many of you look at that as a defeat or as a loss versus how many of you look at that as the completion of a stage of this? The president has promised over and over that the wall is going to get built. He continues in his efforts to get it built. Nobody can say he isn't trying. Nobody can say he has caved on the premise of controlling illegal immigration and shoring up the border. These are all the things they're factoring, I'm sure, at the White House. And of course, the Drive-Bys think they're all listening to what I'm saying about this before they make up their minds, which I find increasingly incredible. But they even said... Before this program began, there were elements even on Fox News, folks, that were saying, "The White House is waiting to see how talk radio plays this." I just think somebody is so out of their gourds on this because of their ongoing belief that Trump is some ogre and not sophisticated, not capable, not an individual thinker, and he just... They still don't know who the man is. They still don't know who they're dealing with. They still haven't taken the time to learn and figure it out. But they're completely misguided on it, in that view of how Trump does business and politics. 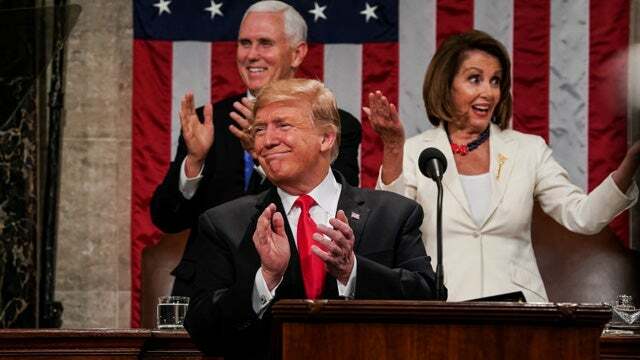 RUSH: Do I think the president is happy with this? No! There's no way the president's happy with this. There's no way this satisfies him. What do you want? What do you want, folks? It's $1.375 billion... Here are the numbers again. We have $1.6 billion authorized; the number the president wants is $5.7 billion. Originally, before December 19th, he had $1.6 billion. That we get taken out. Trump gets zero; we got government shutdown. The Drive-Bys tell you he was ready to sign it except for I blew up. That's BS. They tried to make it like Trump can't make up his own mind; Trump's an idiot. It's the ongoing effort they're continuing to make, but they have totally misrepresented that. I still can't believe it -- and they're still doing it. Okay. Now, we've got the government shutdown. Trump's approval numbers after the government shutdown and State of the Union skyrocket from 43 to 52% -- and the internals are even better than that. Why do you think the Democrats haven't mentioned the number? The Democrats are moving here. It's less than the $1.6 billion, the $1.375 billion. But Nancy Pelosi said, no money ever. Chuck Schumer said, no money ever. The Democrats have moved here. Why? It's called 52% approval. It's called Trump has, in the government shutdown, succeeded in informing and educating the American people what's really happening here, those that didn't know. So do you think the president should say flat-out, "No," again? "I'm demanding $5.7 billion." They've given him enough money to build 55 miles of the 64-mile expansion he wants. Should he shut it down again? Should he hang in there, hang tough, and shut it down again, or should he take the 55 miles? Take the $1.375 billion and then maybe, depending on how things go, declare an emergency. Let it wind its way through the courts. Continue to demonstrate the commitment to get this done while demonstrating the Democrat Party -- which was perfectly fine, by the way, when $1.8 billion in cash landed on the tarmac in Tehran. It has been phrased, somebody said, that this Green New Deal and some of these other proposals may be the longest suicide notes that anybody's ever written. So the political opportunities will be rich and ripe for the president going forward here. The question for you is: If he signs this $1.375 billion and declares a victory in it, are you going to accept it? RUSH: Let's get started on the phones. As you can imagine, people to want weigh in and react. Just one thing. There's a cabinet meeting in the White House. The president's allowed the cameras in. He spoke at length. He monologued. He made it clear he is not happy with what the Democrats have given here. He said he doesn't can a expect there to be another shutdown, but if there is, it's gonna be all on the Democrats. He cannot believe that they are not willing to be serious about this, and he's very, very disappointed. He's not happy with this at all. But there was no definitive word from him on whether he's going to sign this or not. There's a third alternative here and that's just tell them to go pound sand and to not sign this thing and do another shutdown and then make tracks right to that national emergency and declare it and then go through whatever court battles there are going to be. I mean, this is a signature issue for Trump. This is a fundamental signature, foundational issue of his campaign and why he got elected. And if he signs this, he's gonna have to make the case that you never get everything you want all at once in Washington. We've got a divided government. We got 'em off the zero, we're moving in the right direction. We're continuing to build the wall. He made that point right now. He said we're continuing to build the wall. Mick Mulvaney, the chief of staff, said they got money all over the government if they need to get it to build whatever wall they want, however much wall they want. They've already found areas of the federal budget with unused funds that they can appropriate during the declaration of a national emergency. We'll start here with Brian in San Diego. Welcome, sir. You're up first today. Great to have you with us. CALLER: Yeah. So right to the point, guys like me will not accept if President Trump accepts this deal. It's not a win for guys like us. It's a negative. Even if he takes $1.3 billion it's a negative. It's weakness on that border. It's not what we need. I say shut it down again and let's move forward. We need what we were promised. RUSH: If that doesn't happen, where do you go, what do you do politically? 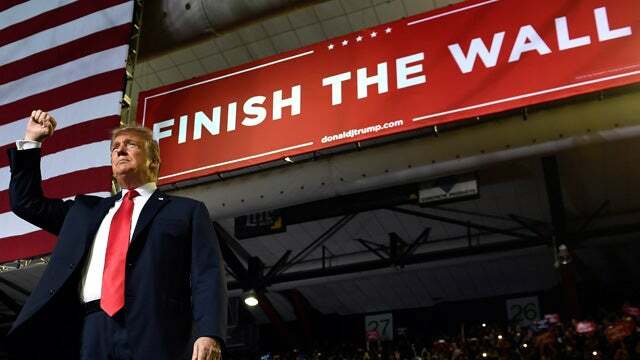 Are you finished with President Trump, then? Are you just deeply disappointed? What are the ramifications? What are you gonna do if you don't get what you want? CALLER: I'm on that line of being finished with President Trump. And the reason being is, I mean, hey, I like him. But this was what we voted on. This is what we wanted. This is what we were promised. This is what needs to come to fruition. And if it doesn't happen, it's a feeling of throwing your hands up and going, "You know what? This is as close as we've got, and we're not getting any closer." And there's no reason to back another promise. RUSH: Okay. So what you basically want -- and correct me if I'm wrong -- you want Trump to defeat the Democrats. That's the first and foremost. Because that's how you get the $5.7 billion. You don't want the Democrats to be able to claim any kind of a win here that results from a Trump compromise? CALLER: Look. It's not a matter of what the Democrats are going to do and be able to say, hey, they won, they didn't win, they got beat by Trump. It's a matter of what this country needs. It's a matter of what's right for this country. It's a matter of guys that walk the street with their families and protecting our families on a day in and day out every day mindset and dealing with what has been described across the nation with what's coming over the border. You have full on communities that have changed, lifestyles have changed, and it doesn't mean just for -- and I know how a lot of people out there take it. Oh, you know, just for the tall white guy out there. It's not. It's for all immigrants that have come here legally, it's for this United States way of life, it's for what we are. And what's coming across the border is not what we are. It's not what the United States of America has promised its people. 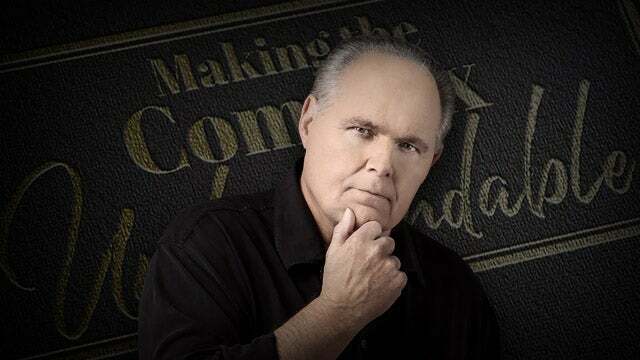 RUSH: That is true, because the people coming across in large numbers, the illegals, have no desire to assimilate and join the American culture as you've just described. That's precisely why the Democrats do want them. Okay. Look. I appreciate the call, Brian. We move on to Jamie in Columbus, Ohio. It's your turn. Hello, sir. CALLER: Hello, Rush. I have to say it is an amazing honor. I've been listening to you since I was a kid. Thank you for taking my call. CALLER: -- a couple years now. RUSH: Look. Let me put some things in perspective. There are some things about this that frustrate me to no -- $5.7 billion is peanuts. It's a rounding error in the federal budget of $4 trillion, $5.7 billion is less than what the country spends on food stamps every month. Trump's $5.7 billion is enough money for 200 miles of border wall or fence, not just 64. It's enough for 215 miles of barriers. which includes a hundred miles for new fencing and the rest to fix existing barriers. And this is according to the CPB. Now, the political way of looking at this -- hey, folks, I'm just telling you what I am sure how this is being looked at in the White House. Not by the president. He's got his advisers, and I'll guarantee you the way this is being looked at. A, you got divided government. So in reality, how much can you actually accomplish in divided government. In addition to divided government, you have a presidential election year. Then that means the opposition party isn't gonna give the incumbent president anything. You got 20 Democrats running for president who are trying to out-leftist and out-socialist each other. They are creating a traveling circus out there. We've got the specter now that the Mueller report's gonna be a big dud for the Democrats, which is gonna just tick them off to no end and their deranged voters. In the meantime, with divided government you never get everything you want all at once. If you have the objective of building a wall for border security to stop illegal immigration, you take what you can get when you can get it, and you keep asking for more, demanding more, or what have you. 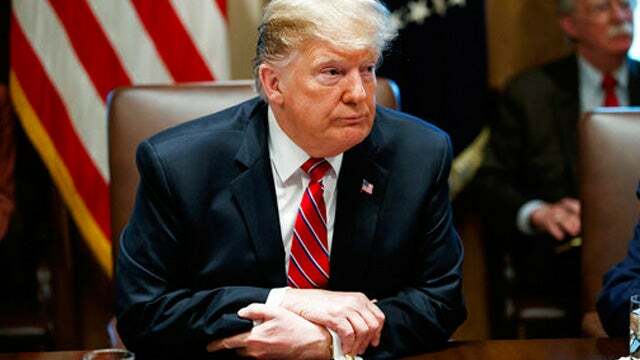 Trump then goes to you and says, "We're continuing to fight against these people who are intransigent, they are not willing to compromise, they don't care about border security." He continues to make the political case, advising and informing the American people of exactly what the Democrat Party has become and who they are. Because just as the Democrats are running for the presidency in 2020, so is Donald Trump. And the political realities do intersect all of this. There is a campaign coming up, and there are things that need to be considered as far as that campaign's concerned. The other way to look at this is, "To hell with all this political stuff! To hell with compromise with the Democrats, 'cause it still doesn't get us where we want to go. Shut the government down again. To hell with it all! Shut the government down again and do not reopen the government until everything the president wants and demands for border security has been provided." The president maintains he's still undecided. He is unhappy with this deal. He's being pressured by a lot of people to take it. He's also being pressured by members of Congress not to take it. There's a whole caucus of conservatives in the House who are counseling the president to punt on any negotiated deal, and just go right to a shutdown and the declaration of a national emergency -- particularly since they've heard the chief of staff say they've got the money from other areas of government to do it. So there's a lot of moving parts in this, with a lot of people weighing in on what they think is the best thing for the president to do, taking all of these various factors into account. RUSH: Couple of audio sound bites. President Trump this afternoon White House during cabinet meeting. Before the meeting, a little press gaggle. A reporter: "Mr. President, will you sign the conference committee's border deal?" THE PRESIDENT: I'm not happy about it. It's not doing the trick. But I'm adding things to it, and when you add whatever I have to add, it's all gonna happen where we're gonna build a beautiful, big, strong wall that's not gonna let criminals and traffickers and drug dealers and drugs into our country. It's very simple. It's very simple. We're building a wall. And now I'm saying, we're finishing a wall. Am I happy at first glance? I just got to see it. The answer is, no, I'm not. I'm not happy. But am I happy with where we're going? I'm thrilled. RUSH: All right. See, that's exactly all I'm trying to tell you. It's movement in divided government incrementally. I'm telling you, that's how they're gonna be looking at this up there. I, frankly, think... Folks, I think it's embarrassing -- $1.375 billion, $1.6 billion, I think it's embarrassing. It's not even... It's so low, I keep calling it "a rounding error." But it is not even an amount of money that auditors would care about if they couldn't account for it in a $4 trillion budget. If he signs this thing, he's not going to be celebrating anything or praising it. If he signs it, it's gonna be for other reasons. If he signs it, primary it's gonna be to avoid another government shutdown. You know the pressure to avoid another shutdown is immense. If I were there, that's the last thing you should be thinking about right here is whether a government shutdown is gonna hurt you or not. That's not even a factor in terms of, you know, where your political vulnerabilities are. Traditional Washington thinks shutdowns are big determining factors in political fortunes of politicians. But you, Mr. President, it's not. You are operating under an entirely different set of rules with your voters, an entirely different set of demands and expectations -- and whether or not this government gets shut down? Most of your people are happy when the government gets shut down because of what this government has become! Anyway, one more sound bite here. Another reporter, unnamed, said, "Are we gonna see a shutdown?" THE PRESIDENT: I do not think you're going to see a shutdown. If you did have it, it's the Democrats' fault. And I accepted the first one, and I'm proud of what we've accomplished because people learned during that shutdown all about the problems coming from the southern border. I accepted it. I've always accepted it. But this one I would never accept if it happens, but I don't think it's gonna happen. But this would be totally on the Democrats. I am extremely unhappy with what the Democrats have given us. It's sad. The bottom line is on the wall: We're building the wall and we're using other methods. RUSH: You can interpret that however you wish. I choose to believe that he's not going to stop anything until he gets this wall built, whether it appears via legislation like this, compromise deals, spending deals... I think this needs to be taken out of a whole spending compromise sphere anyway. Let me grab another phone call while we have time. Robert in White Plains, Maryland. I'm glad you waited. I appreciate your patience. Hi. RUSH: Right, and that number is 40,520. This deal appropriates funding to detain a maximum of 40,520 illegal-alien criminals or detainees -- and that, by the way, is the number of beds. They would do that to buy 40,520 beds. That's so you can sleep people overnight and that's part of "humane detainment" and so forth and that would be the limit. But you're right about that. Once the maximum has been reached, and we're probably pretty close to it already, then you can't stop any illegals anyway. You've got no place to put 'em! So you have to find some way to stop them. If you don't get the wall to do it, you have to use other techniques and measures to do it. So this is a good illustration, again, for people who are not fully up to speed of what we're up against here. I've... (sigh) You know, I've gone hoarse explaining the American left to people and the Democrat Party and who and what they are -- and I'm telling you that their target is this country and its founding and overturning it. Not fixing any of the things that have gone wrong or are wrong. And all of the fixes like ending slavery, affirmative action, none of those things matter! None of those things matter. There's never gonna be enough fixing we can do! This is all about helping the illegal aliens ostensibly reclaim the land that was theirs from the get-go that we stole from them when we landed, shortly after Columbus and the white Europeans came -- and you know that drill. RUSH: Somebody just said to me, "Rush, you know what's going on. Everybody's kicking this thing down the road to the 2020 election." Well, that's not how we... We already did this. We already decided this in the 2016 election. That's why Trump was elected in the first place, not to kick it down the road to 2020.